Pratt Industries is happy to report recycling successes for various sponsored events this past America Recycles Day, November 15. 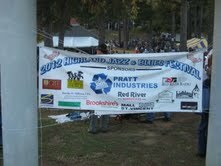 One of the larger events took place at the 9th Annual Highland Jazz and Blues Festival in Shreveport’s Columbia Park. Great music, eclectic food and arts and crafts brought people in from around the Ark-La-Tex. 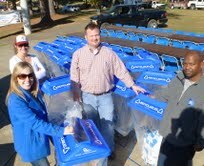 Pratt Industries was on site with banners to promote America Recycles Day along with containers to collect recyclables. A booth was also located in the vendor area where information from Pratt and Keep America Beautiful was distributed. This event had a great turnout and was both fun and educational! America Recycles Day is an annual celebration and is now officially recognized as such per a proclamation from President Barack Obama. Over 40,000 people to date have already taken a pledge to recycle more on AmericaRecyclesDay.org. Will you do the same?